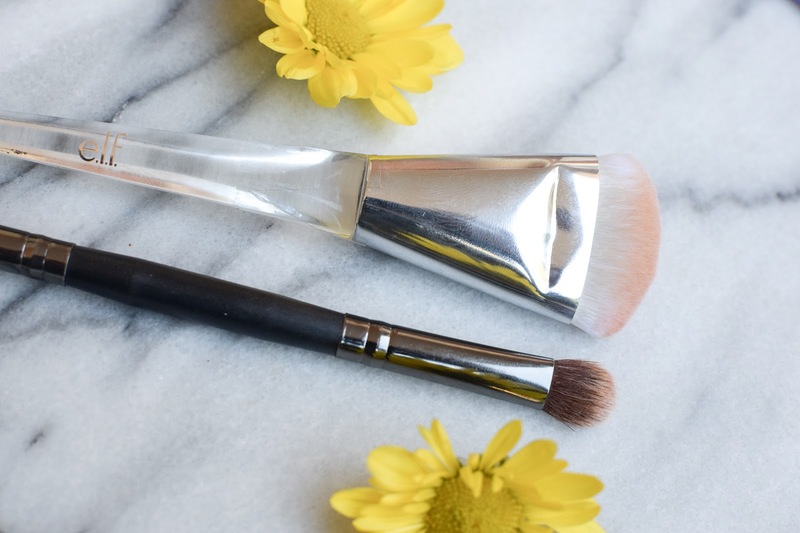 Today, we're picking up where we left off from this post and talking about the starter tools to have in your first makeup collection. Let's begin, shall we? Here is our lovely little overview of the starter tools. As you can see we've got tools for complexion products, eyes, and the extras (like, blush and bronzer). Starting out with your base, you need tools for the complexion products you would have chosen since the last post. If you recall, our base products included primer, foundation, concealer, and translucent powder. Primer is easily applied with your fingertips, so that tool is free! To apply foundation, you'll need some kind of tool to make everything blend seamlessly. I prefer to use a beauty sponge - it's super quick and easy to apply most of my preferred foundations with this type of application. 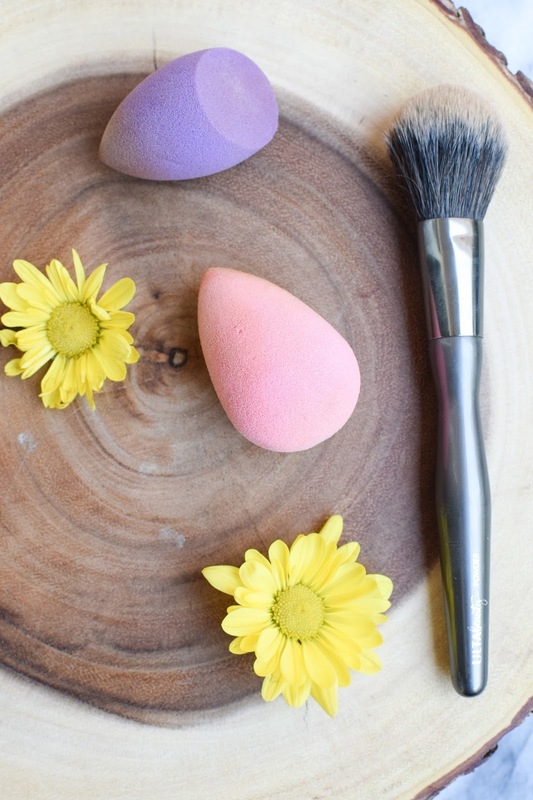 My favorites are the beauty blender, and more recently, the Tarte sponge! I love the flat side of the Tarte sponge because it can also blend out under eye concealer like a dream. 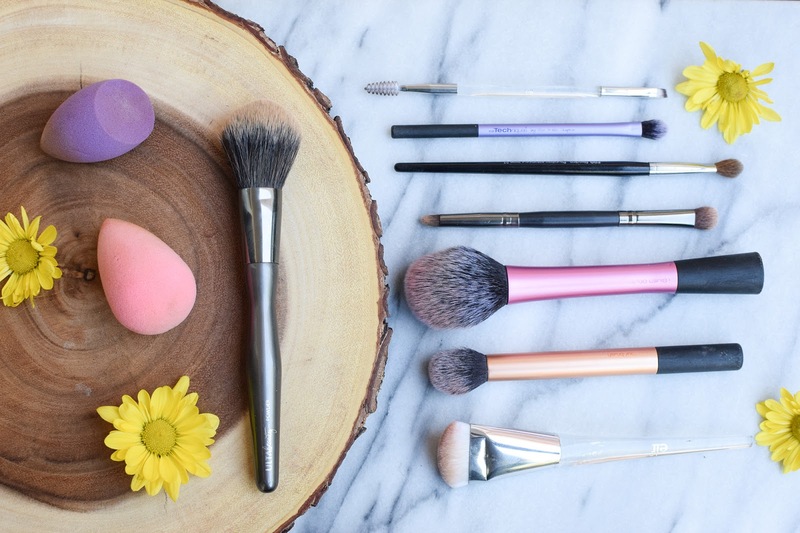 When it comes to powder, you'll definitely need a brush. Since you're a beginner, you're not ready for baking just yet so a small amount of translucent powder dusted across your face with a fluffy brush will be your best bet. Next up, we've got the trusty eyebrow brush. I like this one because it's double ended - two tools in one! The brush on this guy is super soft making it easy to control how much product is going onto your brows. Start soft, then build it up. I've got a bunch of eyebrow tutorials on my YouTube channel, so click here to check out that playlist! Now it's time to add the color back into your face, and these guys are great tools to do that! I like to use a fluffy tapered brush to apply my blush. It's super easy to apply just the right amount of product with this type of brush since the brush hairs aren't super dense. As for bronzer, I usually do more of a focused contour/bronzer application so I use this smaller, more dense brush. This brush gets right into the hollows of my cheeks, and is small enough to add a light nose contour! Next up, we've got our highlighting brushes. Personally, the tools I use for highlighting changes day to day. Sometimes I prefer to use my beauty blender to apply a highlight, other days a brush, and sometimes I use my fingers instead. If you want to keep your fingers clean and get a more intense highlight, a narrow brush is the way to go. You can apply the highlighter in exactly the spot you want it, and use the same brush to soften it up. 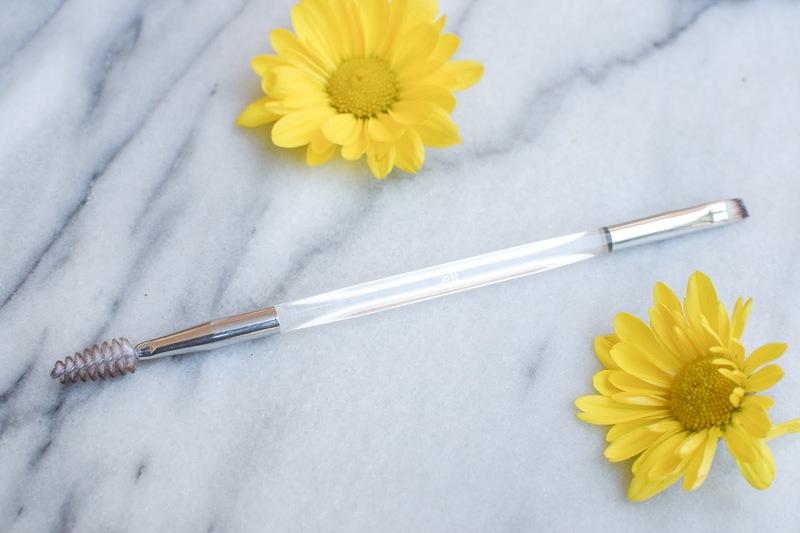 I use the smaller brush pictured to apply highlighter to my nose and my brow bone - all of the places that are too small for a large brush to get to. 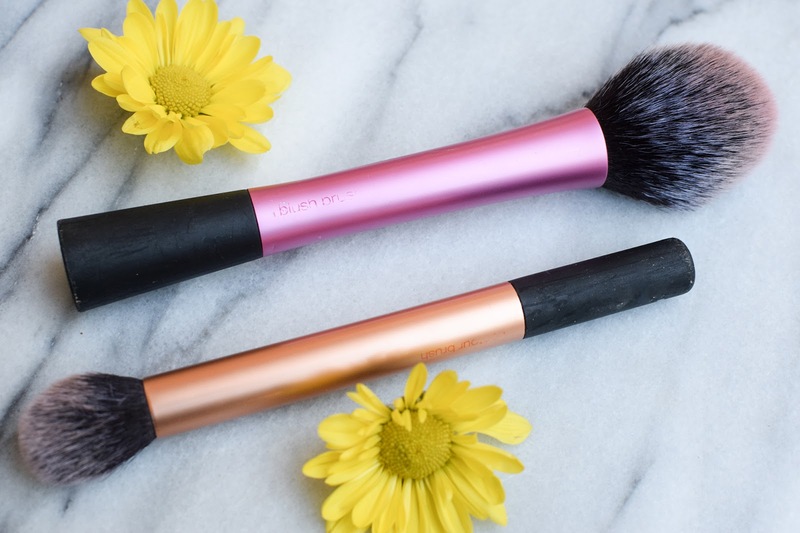 Finally, we've got our basic shadow brushes. 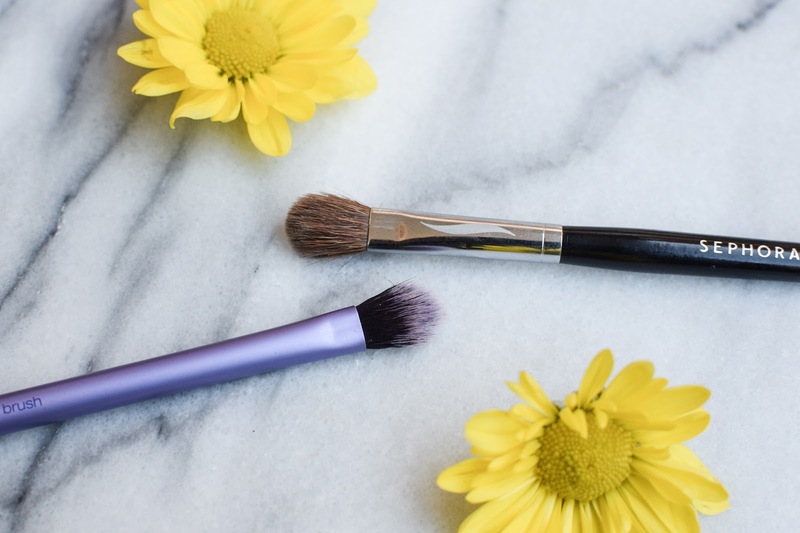 For a beginner's kit, the main ones you'll need are an all-over lid brush, and a blending brush. Usually beginners aren't going to be too experimental with their eyeshadow looks, so these two basic brushes are just enough! What other tools do you think beginner's might need in their arsenals? Let me know!